Ice cream might be my favorite thing ever. Homemade ice cream, though, was always super disappointing to me. Icy and chalky, or melty and weird, eggy and off– I had basically never met a homemade ice cream that I liked. This changed when my dad bought me an ice cream maker attachment for my KitchenAid mixer, and I decided that I would conquer homemade ice cream or die trying. What followed was enough to make vegans weep. I went through eggs and milk like nobody’s business. I tried recipe after recipe and technique after technique. My freezer was full of frequent failures and intermittent successes. My final master recipe uses the technique of America’s Test Kitchen (the holy grail of recipe testing) with a recipe I’ve tweaked to my liking. I don’t like excessively eggy ice cream, and I don’t want it icy or thin, either. It’s got to be perfect– and this, to me, is pretty darn close. This is my Bailey’s variant: cool and creamy, with an undercurrent of minty sophistication and a ribbon of chocolate fudge. And although it may seem like a lot of work, it’s really only two steps, with some waiting in between: 1. Make a custard 2. Churn the custard into ice cream! It requires a thermometer (like this one), a whisk, a 9×9 cake pan, a strainer or sieve, and some sort of ice cream maker. That may seem like an investment, but the number of times I’ve purchased a pint of ice cream since I learned how to make it is zero, and I used to be one of the reasons Ben & Jerry were opening so many new stores every year. If you love ice cream like I do, this may just change your life. IMPORTANT NOTE: If you have a canister-style ice cream maker, the canister must be frozen at least 24 hours ahead of time. Put your 9×9 metal cake pan in the freezer then, too! 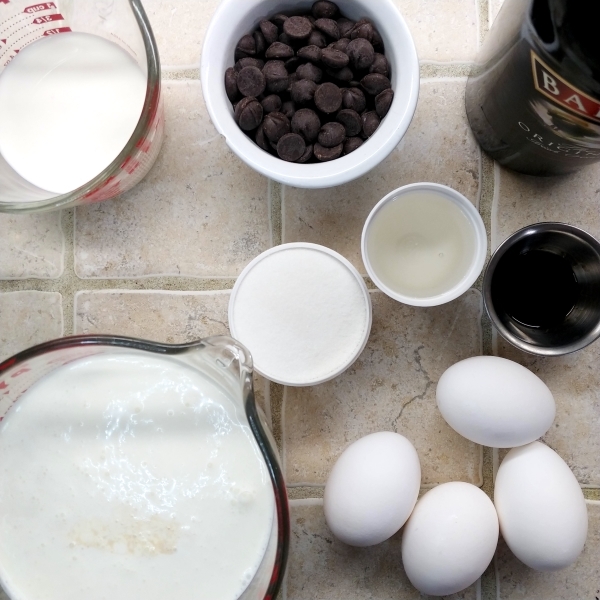 Add 2C whipping cream, half and half, Bailey’s, 1/4 C sugar, and corn syrup to a medium saucepan. Whisk egg yolks and remaining 1/4 C sugar together in a bowl. Heat milk mixture on medium-high heat until it reaches 175F, stirring frequently (it should be just steaming and making little bubbles near the edges). 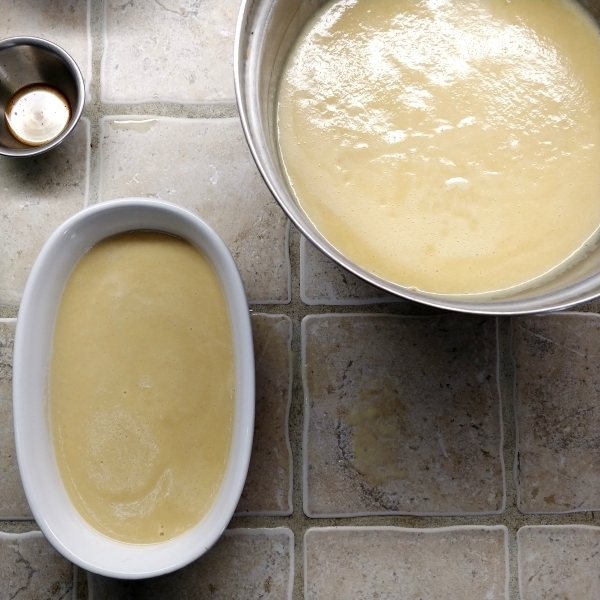 Take the saucepan off of the heat and add one ladle of the milk mixture to the egg mixture while whisking vigorously. Why this laborious step? Well, yolks cook at 145F, and your liquid is WAY hotter than that. You’re bringing the eggs closer to the temp of the main mix, so as not to scramble your eggs and discover yet another gross variant in homemade ice cream disasters. This is called tempering them. Add the egg mixture back into the milk saucepan, again whisking vigorously to mix the eggs in quickly. Heat the mixture back up to 180F. You will know it is close when it starts looking thick, and your spatula is coated like it’s been in pudding when you bring it out. It will also start to kind of bubble around and thicken. At my altitude, this takes only a few moments, but it could take you as many as 10 minutes. 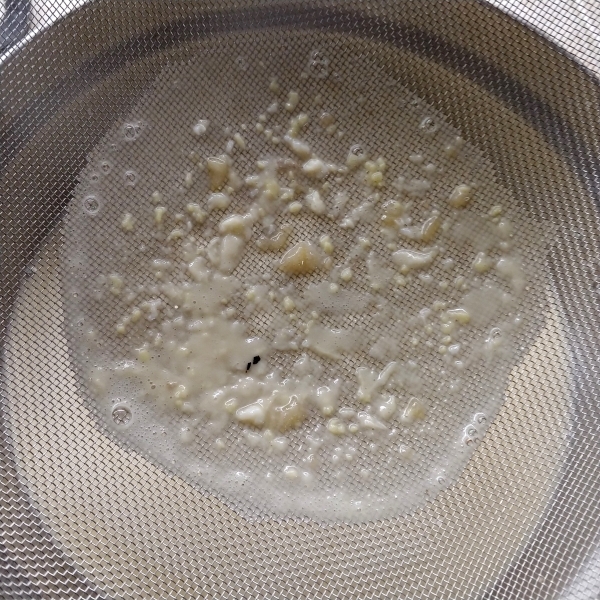 Take the pan off the heat and stir in the vanilla. Strain the mixture into a heatproof bowl. You don’t HAVE to strain it, but even though I temper the eggs, I absolutely always have a few bits of egg that didn’t temper and straight up cooked, and I am not going to ruin my ice cream with pieces of omelette. Ladle a cup or so into a smaller container. When the containers are no longer steaming, cover them with plastic wrap and put the larger one into your fridge and the smaller one into your freezer. Chill for at least 4 hours. 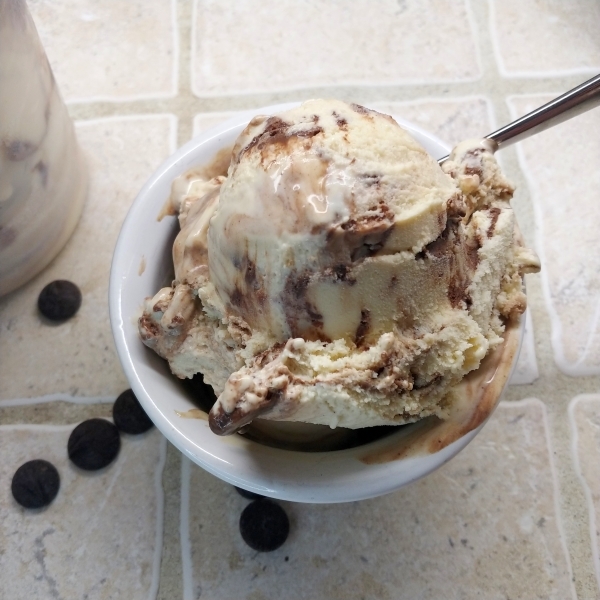 About 20 minutes or so before you plan to churn the ice cream, make the2-Step Ganache. When you’re ready to churn, set up the ice cream machine, leaving the canister or bowl in the freezer until the last moment, if possible. Whisk the frozen ice cream batter into the chilled ice cream batter. You kind of have to smoosh the chunks up and then whisk it up at the end. The little bit of frozen batter should super-chill the rest, making it much colder and speeding the freezing process. This means you shouldn’t get ice crystals in YOUR homemade ice cream. When it is incorporated, turn on your ice cream machine and churn according to its instructions. You may find that your ice cream is ready much sooner than the instructions indicate. That is what we are going for here! 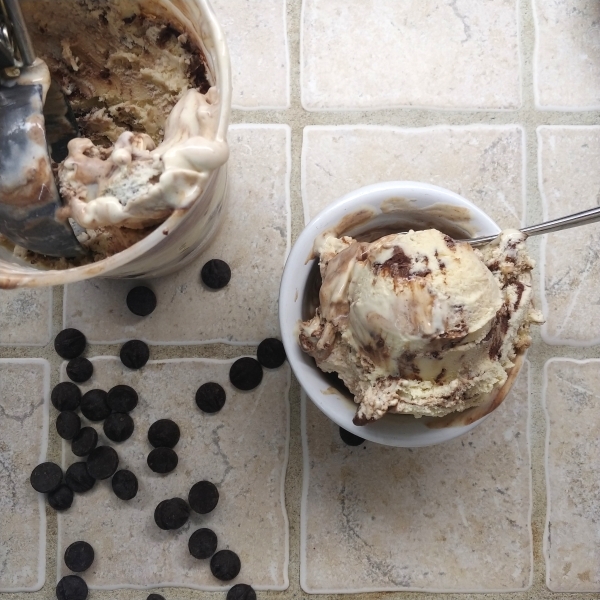 When the ice cream is ready, scoop it out into the pre-frozen 9×9 pan, smoothing it out. 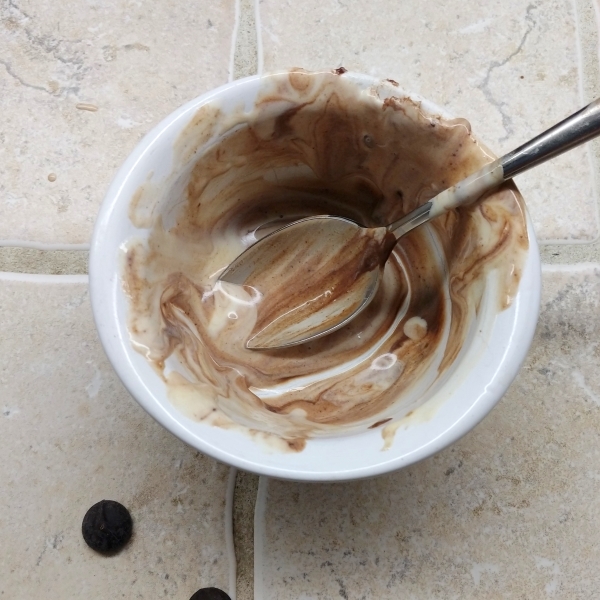 Drizzle the chocolate ganache over the top. (Like I said, mine was too loose, so I just poured it all on top and kinda swirled it through. Doesn’t matter, it will still taste amazing. NO ONE WILL KNOW!!) Gently swirl through it with a knife. Press plastic wrap or waxed paper onto the surface and freeze for 1-1 1/2 hours. I couldn’t wait that long because I had to get to a softball game, so mine is way looser than yours should be. You want it softly frozen, not soupy. Once again, do as I say, not as I do…. I think mine still turned out fine, but you’ll have more uniform ripples and such if you wait to pack it until it’s a little harder. It probably didn’t help that it was hotter than the hinges of Hades in my kitchen, either. Anyway, after you’ve waited, scoop the ice cream out into an air-tight container (you’ll have slightly more than a quart), packing it tightly so there aren’t air pockets, and freeze for at least 2 more hours, or until hardened. Then EAT AWAY. 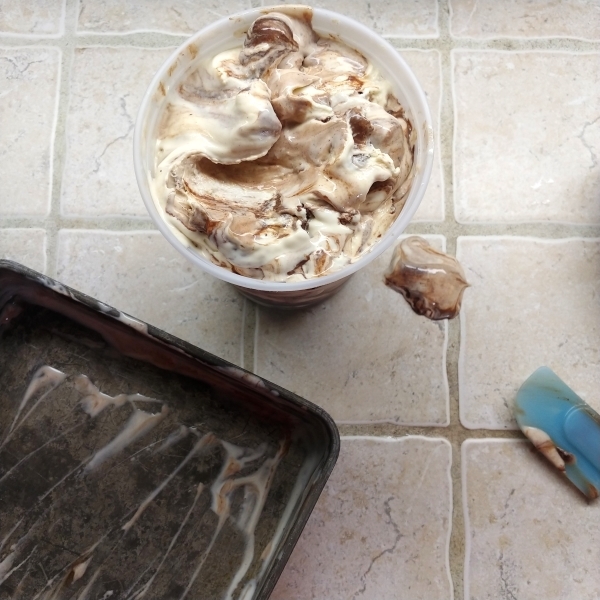 To keep your ice cream longer, cover the top with plastic wrap as you scoop down into the container. That is, if you need to keep it any longer than a day or two. I find that this ice cream is so rich I only need a scoop, no more, but if you have a family, or are saintly enough to share it with your friends, you will go through this quart in no time. And you will never. look. back.